Three recent reports focus on the business case for sustainability, green buildings and human-centric buildings. Are we now witnessing the new normal, where the question of sustainability cost is flipping from, how much extra will the sustainable building cost? 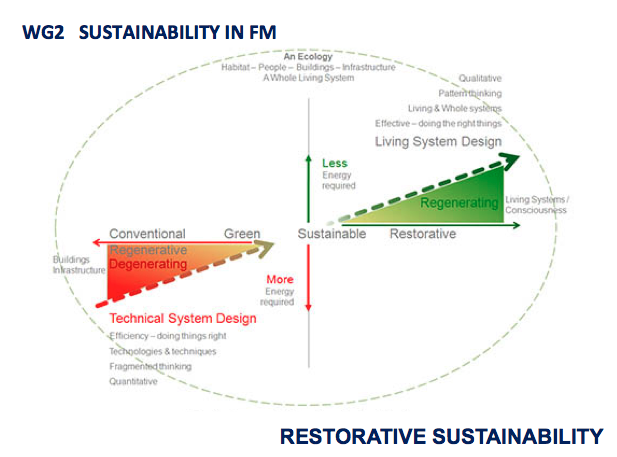 to, what are the real costs in not providing sustainable buildings? The WorldGBC Business Case for Green Building: A Review of the Costs and Benefits for Developers, Investors and Occupants, examines whether or not it is possible to attach a financial value to the cost and benefits of sustainable buildings. The report highlights how green buildings can be delivered at a price comparable to conventional buildings and investments can be recouped through operational cost savings. It also notes that with the right design features, green buildings can create a more productive workplace. The report specifically focuses on the potential benefits of green buildings throughout the various stages of the building lifecycle, from reduced costs during the design and construction phases through to improved health and productivity of workers when a building is in use. The UKGBC Report Capturing the Value of Sustainability, Identifying the links between sustainability and business value focuses on a wider business case for sustainability, looking at at the challenges that businesses face in trying to identify the value they derive from their sustainability initiatives. … the purpose of this report is to empower businesses and individuals to make the business case for environmental and social impact activities and to enable them to measure and demonstrate the value their organisations derive from such practices. Much has been written on how businesses are moving towards doing more good rather than less bad. The phrases ‘net positive’ and ‘restorative enterprise’ are now appearing within sustainable business circles, with both referring to businesses that put back more than they take and restore social and natural capital whilst making a profit. Such businesses may be termed as using a ‘business with impact’ approach or being a ‘purpose driven’ organisation. In this context, ‘purpose’ may be de ned as ‘an aspirational reason for being which inspires and provides a call to action for an organisation, its partners and stakeholders, and provides bene t to local and global society’. The white paper from Buildings 2030: Building 4 People: People-Centric Buildings for European Citizens published in November 2017 notes how the buildings we live and work in are affecting our environment, our physical & mental health, our wellbeing and our productivity. This entry was posted in comment, sustainability and tagged Build 2030, business case, COST Restore, costs, FutuREstorative, green building, people, sustainability, UKGBC, World Green Building Council on February 1, 2018 by martin brown.